An unaltered photocopy of your DD-214, WD AGO, NAVPERS, NG or other military issued document clearly displaying your Air Force Enlisted rank or promotion. The Aerial Achievement Medal was established on February 3, 1988, by the Secretary of the Air Force Edward C. Aldridge, Jr. The Aerial Achievement Medal has been in effect since January 1, 1990. 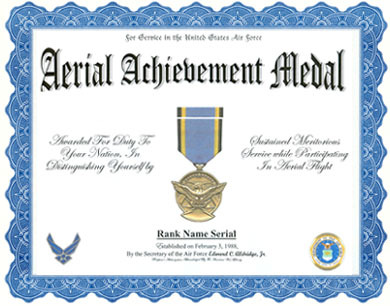 The Aerial Achievement Medal may be awarded to individuals who, while serving in any capacity with the Air Force, distinguish themselves by sustained meritorious service while participating in aerial flight. The Aerial Achievement Medal is worn after the Air Medal and before the Joint Service Commendation Medal. Additional awards of the Aerial Achievement Medal are denoted by oak leaf clusters. The Aerial Achievement Medal was designed by Technical Sergeant Gerald E. Woo, USAF. The first recipient of the Aerial Achievement Medal was Captain Toby M. Kay, USAF. In the center of a bronze disc one and three-eighths inches in diameter, an eagle facing to its right is shown with its wings displayed. The tips of the eagle's wings extend beyond the edge bringing the medal to an overall width of one and three-quarters inches. Above the eagle, and following the contour of its upper quarter (but just inside its raised edge), are thirteen five-pointed stars (point up). The stars on either end of this array and the one in the center are larger than the remaining ten. Behind the eagle are two intersecting arcs which cross behind the eagle's head. The eagle is clutching a cluster of six lightning bolts in its talons, and the bottom two extend beyond the rim of the medal forming a triangular configuration of which the bottom leg is the lower rim of the medal. The eagle is the American bald eagle, symbol of the United States, and its wings extending beyond the boundaries of the medal allude to freedom. The thirteen stars allude to the thirteen original colonies and thereby to all of the United States; the arcs represent the flight paths of aircraft, while the lightning bolts represent the Air Force. A raised plaque appears in the center of the reverse. Above the plaque are the words, FOR MILITARY and below the plaque, MERIT. The predominant color of the ribbon to the Aerial Achievement Medal is "Bird Blue," which is bordered on either side by an eighth-inch stripe of "Golden Yellow" and edged with "Flag Blue." AMC - the highest PQI rating for the quarter. And with proper ACK and SITREPs submitted in a timely manner. This decoration, established by the Secretary of the Air Force on 3 February 1988, is awarded by the Department of the Air Force to U.S. military and civilian personnel. It is awarded for sustained meritorious achievement while participating in aerial flight. 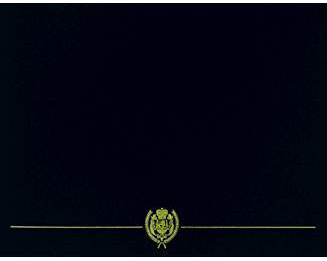 The achievements must be accomplished with distinction above and beyond that normally expected of professional airmen. Approval or disapproval authority is delegated to wing commanders for military and Secretary of the Air Force for civilians. MAJCOMs will identify the missions and positions that qualify for this award. HQ USAF/XO must certify MAJCOM criteria.